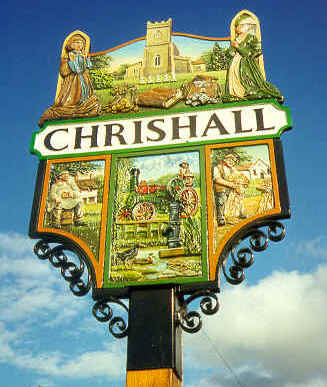 Chrishall Grange is the first part of the village of Chrishall that you come through if approaching the village from the main A505 road. As far as I know it has always been a large farming estate and, as the obituary for Mr Jonas below shows, it has been farmed by some eminent agriculturalists. While Mr Jonas was farming at Chrishall Grange he obviously also took a keen interest in improvements in the main village as he was one of the people instrumental in setting up the village school which you can read about here. He was also involved with a large refurbishment project at the church in 1869. The obituary below comes from the Lincolnshire Chronicle and was published on 9th June 1871. This well-known agriculturist died at Chrishall Grange, Essex, on the 1st inst., in the 69th year of his age. Mr Jonas was born at Great Thurlow in Suffolk, on September 27, 1802. It is, however, with the county of Cambridge that his name is more identified as “Sam Jonas of Ickleton,” where he farmed extensively for many years. He was, moreoever, the agricultural historian of the county, and of the farming of Cambridgeshire. Mr Jonas was also instrumental in establishing the Saffron Walden Agricultural Society, now merged into the Essex; while he was from the first a prominent member of the Council of the Royal Agricultural Society, where he was for years on most of the sub or really working committees, as well as a steward of stock at many of the shows. Mr. Jonas was equally distinguished as a leading man at the meetings of the Protection Society, as a director of the Royal Farmers’ Insurance Company. About fourteen years since he left Ickleton, and took in hand about three thousand acres of land at Chrishall Grange, near Saffron Walden. The largest portion of this extensive holding, when first engaged on by him was in an exhausted state, but his energy and determination soon brought it round. We believe we are justified in saying that, for the spirited manner in which he cultivated his land, and the large sums he expended in food for stock and artificial manures, Mr Jonas will rank worthily with Mr Hudson of Castle Acre, and other such eminent English farmers. Great Thurlow have a fascinating history of their village online. Here in the ‘Nineteenth Century’ section is mention of Samual Jonas, farmer, quite possibly father of the Mr Jonas who came to Chrishall Grange. Ickleton have a ‘people’ database where you can find entries for the Jonas family and wonderfully they also have pictures of Samuel and Ann in their photograph gallery. Go to http://ickleton.org.uk/gallery/main.php and do a search for Jonas and you will find lovely portraits of Samual and Ann plus photographs of their graves for they are buried in Ickleton. Saffron Walden Agricultural Society: see prize-winners list here (which includes a Joseph Tinworth, a local family name of course!). It is good to see that Essex Agricultural Society is still going strong, as is the Royal Agricultural Society of course. Editors note: I love the mention of ‘sub or really working committees’ – a little dig at the main committees perhaps? 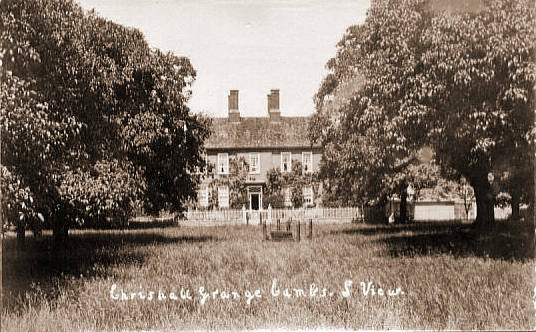 I have a letter from Chrishall Grange dated 25th November 1784 written by Mr A Reece to Frederick Booth Esq at Craven Street, Strand, London which is stamped ROYSTON and refers to the possible sale of Nugent Park Farm which he owns. Frederick Booth was an attorney and had the doubtful distinction of being the brother in law of the Rev James Hackman who was hanged in 1779 for the cold blooded murder of Martha Ray who was the Mistress of Lord Sandwich. A letter addressed to him was found in James Hackman’s pocket following his arrest. If anyone has information about Mr Reece or Nugent Park Farm I would be interested to have that information.